We used Vintage Limo for our getaway car following our wedding reception. The white Bentley (Caroline) was beautiful and the driver was very friendly. They had a just married sign on the back and provided champagne and glasses on the way to our destination. Dwight is probably the sweetest and most professional guy in the Charleston limousine business! We got married at Old Wide Awake Plantation, so I needed a mode of transportation from the house to the ceremony at the river and back as well as the perfect getaway car. When we found Dwight, we knew we had the right driver and the right car! 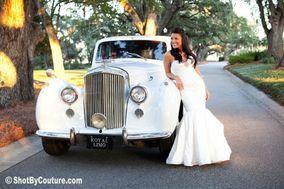 We had the luxury of riding in Caroline, the 1950s white Bentley, for our wedding and as our getaway car. Such a beautiful, classic car! It made our wedding absolutely perfect! We really lucked out with Dwight!! I was trying to find anywhere in Greenville, SC to use a vintage car for our getaway and some pictures. I started to google and I found this company. Dwight has already been so helpful and reasonable on price! He is coming from Charleston to Mauldin, that is quite a drive. I can't wait to see the white Bently in person!!! We enjoyed working with Dwight at Vintage Limo. We had the 54 white Bentley as our getaway car and it was king of the road that night. Dwight was very generous with his time and took plenty of pictures for us. We highly recommend his services! We decided to get a vintage limo to leave our wedding in and went with this company. They are extremely friendly and respond quickly to calls and inquiries. Our driver showed up 45 minutes early to allow for pictures to be taken with the limo and was extremely friendly and helpful. The vehicle itself was immaculate and gorgeous. We would happily choose them again.